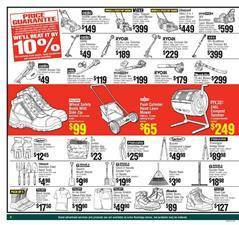 Line trimmers are promoted products of the power tools section for gardening in the latest Bunnings Catalogue. Ryobi's 25.4cc line trimmer provides a convenient use with 430mm cut and a full crank engine. Its price is only $189 at Bunnings this month. AEG 18V brushless line trimmer kit might be your choice for details of your garden. There are also blowers. These powerful products will help you clean every corner of your backyard and nothing will remain to deform your garden anymore. You can buy 2400W blower vac of Ozito for only $49! Masport, Ryobi One+, Victa lawn mowers are also among the featured products from the gardening category of this Bunnings catalogue. Keep your garden nice and clean and leave it maintained all the seasons with these precise and powerful lawn mowers. Check out 1500W Lawnmower that is the cheapest but high-quality. That Ozito's 360mm, 38L, 5 levels adjustable height product will cost only $149 at Bunnings. Moreover, you have hand tools and necessary clothing for work in your gardening zone. Keep it safe with work boots and work shorts. Steel hand tools like a fork, weeder, hand trowel, shovels and more are also available on pg 6. Also, see electrical products by popular brands like Arlec on pg 7.